Jan Iredell, breeder of Bambino Bougainvilleas has brought to gardens and landscapes a wonderful selection of colourful and practical, smaller growing bougainvillea plants. 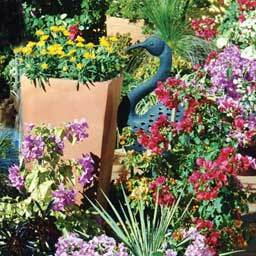 “When I began looking at bougainvillaea available on the market I was taken with their colour but also felt their large size was an inhibiting factor in gardens and landscapes. My mission then became to investigate world wide the smaller varieties available that could be part of my own intensive breeding and selection process. The results, having taken many years to perfect, is the Bambino Bougainvillea range. The intense colour and flower size has been retained but with a much smaller growing bougainvillea plant, eminently suitable for general gardens and containers."